Then ... After a long day at the surveillance convention, Caul and buddies decide to party at his workshop - they pile into a car inside the St. Francis Hotel's parking garage entrance on Geary Street (map). ... and Now, there are mirrors on some of the pillars and the fire extinguisher recessed into one of them has been removed otherwise 40 years on it looks very similar. Then ... 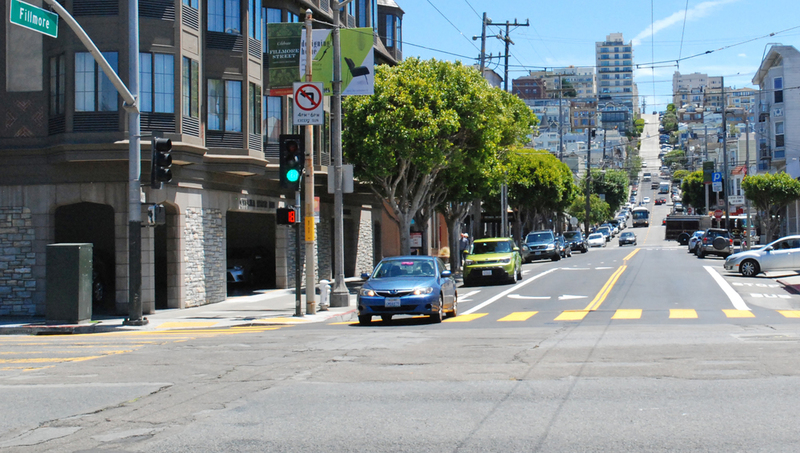 They are crossing Fillmore Street heading west on Lombard in the Cow Hollow neighborhood (map) when a yellow Mustang suddenly cuts in front of them and roars off. ... and Now, at the same junction. Peter's Auto Radio store on the corner of Fillmore at far right above is now a children's toy store. The Arco Car Wash and service station visible above down the block was replaced in 1978 by the Cow Hollow Motor Inn, hidden from here by the trees. Caul's surveillance partner Paul (Michael Higgins) is the driver. But that's a moonlighting job - he's also a cop and, determined to give the exhibitionist driver a run for his money, he takes off after him. The filming of the chase that ensued jumped back and forth along the five block stretch of Lombard between Webster and Divisadero. Then ... The two cars, tires screaming, next make a hard right from Lombard into Pierce. Across the street at far right there's a chain restaurant, the International House of Pancakes. ... and Now, the restaurant is still there, rebranded as IHOP (International House of Pancakes ... get it?). So too is the Surf Motel, but Irv's Union service station seen above on the corner is now gone, replaced in 2007 by the condo/retail building below. Then ... In the next shot they are on Webster, turning at high speed back onto Lombard, this time heading east. Paul is driving his official car and he decides to have some fun - he calls headquarters and requests a '10-28' (vehicle registration details) on the Mustang. ... and Now, for the most part time has stood still on this corner except for changes with the traffic lights. Then ... During the 10-28 call Paul tells headquarters he's heading east on Lombard but even as he speaks we see they now heading west; they have just crossed Scott. ... and Now, the Sands Motel at 2440 Lombard today is a Super-8 motel and further along the Bank of America branch at 2460 Lombard became, until it recently closed, a Blockbuster Video store.
" Heyyy ... Willie Sanchez ... 654 14th Street ... 162 pounds ... 5 foot 10 1/2 ... Shithead! " Then ... Now it's Paul's turn to roar off leaving the Mustang driver wondering what on earth just happened. The cars had stopped at Lombard alongside the Doggie Diner restaurant at 2099 Lombard Street at Fillmore This view looks south past the Mustang along Fillmore Street to its steep climb up to Pacific Heights. ... and Now, another Motor Inn, the Chelsea, now occupies the southeast corner site where the Doggie Diner used to be. The tall building at the top of the hill is the prestigious 2288 Broadway co-op apartments. Back at Caul's workshop Bernie declares ... "The bar is now open! ".